Super Red Empress cichlids are gorgeous fish that are undemanding and great for beginners. Red Empress cichlids are found lake wide throughout lake Malawi. Here they can be found in the sediment free area primarily feeding on algae and other plant material. These haps are a great undemanding species that can be very rewarding in the aquarium. Just give them some rock work to explore and an open swimming area and they will do just fine. They are never too pushy unless they are trying to breed. Here we like to feed Super Red Empress a mix of our spirulina with a little bit of our Plankton Gold to help bring the red out in this fish. Here we like to mix them in with Blue Dolphin, Intermedius, and Azureus. 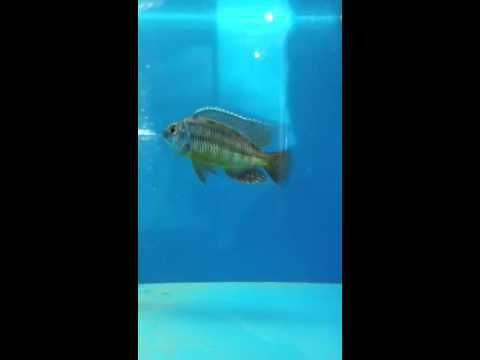 We have many Red Empress cichlids for sale online and some of our males are displaying nice colors. Order 3 or more to save money with our bulk order discounts.